risk attribution for global, multi-asset portfolios. investment programs that can withstand various market scenarios. 1) Map each security to one or more risk invariants, such as: rates, currencies, credit spreads and underlying. 2) Build a covariance matrix using modern statistical techniques, preserving only strong causality. 3) Generate Monte Carlo simulations for normal/log-normal risk invariants. 4) Fully reprice each security in a near horizon and compute profit and loss distribution. 5) Extract security-level risk properties from profit and loss distributions, such as Conditional Value at Risk (CVaR). 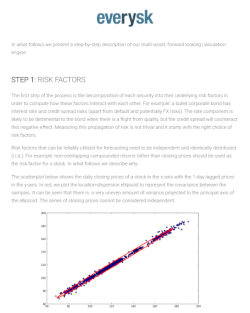 Marginal Contribution to Total Risk (MCTR): measures the contribution to risk from the security or factor. Risk can be volatility or Value-at-Risk (VaR). Conditional Value-at-Risk (CVaR-): measures the expected profit and loss for the worst simulated outcomes. Represents a "worst case" scenario. Also known as Expected Shortfall. Conditional Value-at-Risk (CVaR+): measures the expected profit and loss for the best simulated outcomes. Represents a "best case" scenario. Expected Value (EV): measures the expected profit and loss for the full distribution of simulated outcomes. Represents a "base case" scenario. Delta, Vega, Gamma, Theta, Convexity, Notional Duration, CS01, Risk Weighted Implied Rating, Risk Weighted Implied Duration and others. Maximum Drawdown, Positive and Negative Streaks, Standard and Downside Deviations, Sharpe and Sortino Ratios, Alpha, Beta, Correlation, R2 and others. Exogenous market shocks tend to propagate and impact all securities in your portfolio. Most systems are designed to calculate the impact in a localized manner: interest rate scenarios affect only fixed income, equity scenarios affect only equities. Everysk calculates full propagation, allowing money managers to probe scenarios in a more reliable fashion and avoid losses. Efficient data structures to perform bottom-up risk aggregation and top-down factor modeling. Risks at the security level can be aggregated into GICS sectors, security types, countries-of-risk, liquidity, market capitalization, customized labels, implied rating, duration buckets and dividend yield buckets. Both security and factor risk concentrations add up to total portfolio risk, making it easier to understand each component. Everysk is integrated with many brokers and administrators. Integrations have smart logic to reconcile positions from multiple sources. Positions, margin and cash are automatically mapped and normalized into tagged and dated portfolios. Market, company, reference and alternative data are converted into high-value, actionable portfolio analytics. Flexible symbology allowing for custom bonds, futures or options to be created for further analysis. Design your own factor model on the fly. Everysk will automatically compute the explanatory power of your factors and the amount of residual risk. Efficiently upload your own alternative datasets using Everysk's custom integrations.